Mining-town in Moravia, Austria. While Jews settled at Brünn at a very early time, regulations concerning the Jews of Iglau are not found in the town records before 1250. Charles IV., while margrave of Moravia, sought to stimulate commerce by importing Jews—at that time called "servi cameræ"—into Iglau. Attracted by the favorable conditions, many Jewish families of Bohemia and Moravia settled in the western part of the town, in the "Judengasse," which still retains that name; and they built a synagogue in 1345. Jews lived in Iglau undisturbed for nearly a century; but in 1426 Margrave Albert expelled them from the town, on the ground that they had been in league with the Taborites. They were obliged to relinquish their immovable property; and the synagogue was transformed into a chapel. The exiles settled in the neighboring localities of Triesch, Pirnitz, etc. Iglau was thus the first of the royal towns of Moravia to expel the Jews. The town records show, however, that many Jews returned to Iglau in 1463. After the departure of the Swedes, the municipal council complained, in 1643, that the Jews, who since 1576 had not been permitted to engage in any commerce whatever, dared to traffic in public and to enter and leave the city at will. Since their expulsion in 1426 they had been allowed to enter the city one at a time only, and under certain conditions; and they had not been permitted to remain there. The many quarrels that thus arose were adjusted by the general ordinance of May 18, 1709, permitting Jews to enter the city by a certain gate on payment of an entrance-fee of 15 kreuzer. The census of 1846 showed that there were many Jews from Triesch, Trebitsch, etc., in Iglau. These oppressive conditions remained unchanged till 1848. With the permission of the imperial vicegerency at Brünn the Jews of Iglau founded a religious society April 25, 1861, for the purpose of organizing and maintaining the necessary educational and philanthropic institutions. By a decree of Feb. 17, 1862, there was granted to this society the right to organize itself into a congregation. Its first statutes were drafted in Dec., 1875, and, according to the statutes which were approved by the government or "Statthalterei" June 2, 1878, the congregation included only the town of Iglau. By the law of March 21, 1890, referring to the regulation of the external legal affairs of the Jewish congregations, thirty-one localities within the jurisdiction of Iglau were assigned to the congregation of that town. The statutes of the reorganized congregation were approved by the government Feb. 15, 1895. 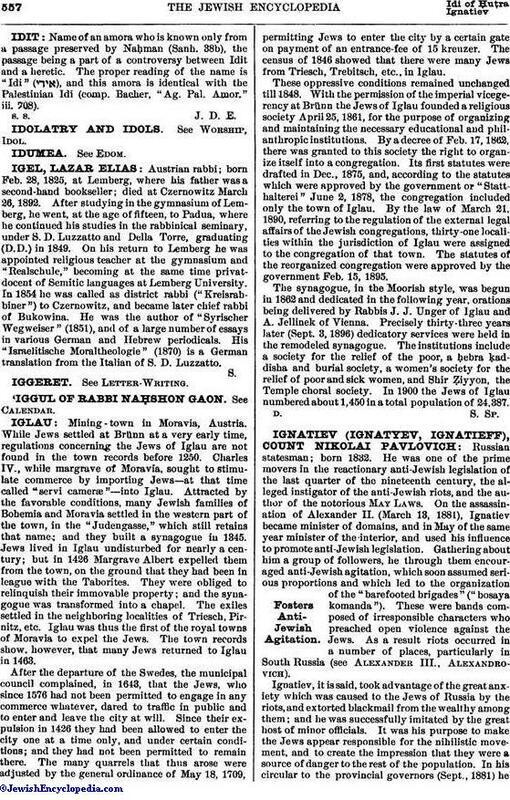 The synagogue, in the Moorish style, was begun in 1862 and dedicated in the following year, orations being delivered by Rabbis J. J. Unger of Iglau and A. Jellinek of Vienna. Precisely thirty-three years later (Sept. 3, 1896) dedicatory services were held in the remodeled synagogue. The institutions include a society for the relief of the poor, a ḥebra ḳaddisha, and burial society, a women's society for the relief of poor and sick women, and Shir Ẓiyyon, the Temple choral society. In 1900 the Jews of Iglau numbered about 1,450 in a total population of 24,387.